Andrews McMeel Publishing, 9781449478292, 352pp. 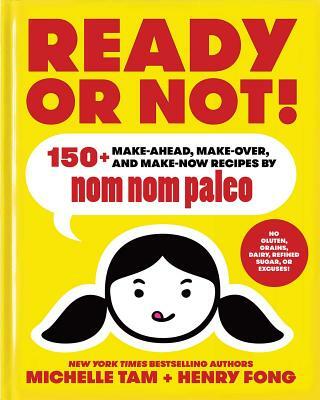 Ready or Not, it's a new cookbook from the James Beard award-nominees and New York Times best-selling creators of Nom Nom Paleo, the wildly popular blog, app, and best-selling cookbook! You know how it is: some days, you're fired up and ready to cook; other days, you dread the thought of making dinner. More often than not, you find yourself floating somewhere between inspiration and desperation. What's a crazy busy (but kind of lazy) home cook to do? GET SET! First, stock your kitchen with essential building blocks--from store-bought necessities to D.I.Y. ingredients that'll set you up for anytime cooking. READY! Got time to cook? Turn to these recipes for make-ahead meals and spectacular dishes like Pressure Cooker Bo Ssäm and Strawberry Almond Semifreddo! KINDA READY! Learn how to transform pantry staples and leftovers into impromptu meals that'll satisfy the most discriminating palates. NOT READY! Emergency meals can be delicious, too. In this section, you'll find super-fast recipes like savory stir-fries and sheet pan suppers. Together, Michelle Tam and Henry Fong are the critically acclaimed co-creators of Nom Nom Paleo, the Saveur Award winning food blog and Webby Award winning cooking app. Their first cookbook, Nom Nom Paleo: Food for Humans, became a New York Times bestseller, and was nominated for a James Beard Foundation Award. Michelle is the working mom and food nerd behind Nom Nom Paleo's recipes and personality. Her obsessions include dark chocolate, trashy reality television shows, and miniature toy food from Japan. Michelle has a degree in nutrition and food science from the University of California at Berkeley, and earned her doctorate in pharmacy from the University of California at San Francisco. For over a dozen years, she worked the graveyard shift at Stanford Hospital and Clinics as a night pharmacist. Henry is a lawyer by day, but moonlights as the photographer, illustrator, and designer of the Nom Nom Paleo cookbooks, app, and blog. He also strokes his beard a lot. Henry is a graduate of the University of California at Berkeley and Yale Law School.